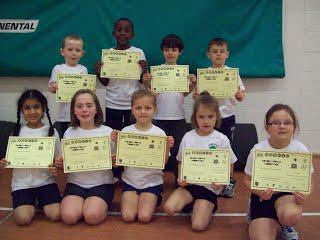 Year One and Two took part in an afternoon of Multi Skills Activities on Monday 13th January 2014. The children had to take part in five activities which tested their balance,speed and agility. The children were tasked to score as many points on the five activities as possible. Year One had a combined score total of 1519 points from their four stations. Year Two achieved a score of 2225 points. The total points scored for Year One and Two was 3744. This score was high enough for Greenfield to reach the Shelfield Partnership Multi Skills Final on Thursday 13th February from 3.30 - 5.30. The top five scoring boys and girls in Year Two represented Greenfield on that night. Unfortunately, several of the team were ill meaning that Greenfield had to send a weakened team on the night. Despite this the children managed to finish a creditable fifth place. On Monday 31st March 2014, Reception had a Multi Skills Afternoon in the school hall. Year One and Two had taken part in a four event festival but Reception completed all of the eight stations during the afternoon.